The MLB post season continues to march on and the Tampa Bay Rays are continuing their best season ever. After dispatching the Chicago White Sox in four games in the Division Series the Rays now turn to division rival Boston in the American League Championship Series. Back to share his insights and opinions on this series is RJ from the popular fan site DRays Bay. Welcome back, RJ! 1. Experience vs. Youth – The Rays won the season series 10-8 but in recent years MLB’s post season has belonged to the Red Sox. What kind of advantage does that 10-8 regular season edge give the Rays in this series? RJ: I don't think it gives them any advantage. We're talking about such a small, concentrated sample size in a playoff series that sometimes the better team won't win a shortened series. 2. Hard Feelings – The is no doubt that these two teams don’t like each other but is there a chance we’ll see another Coco Crisp type incident? RJ: Hopefully not. These two teams have played a few series since with no damage done. Interestingly the Baltimore Orioles got a little too happy about hitting Rays hitters in one of the final series of the season and were on the receiving end of a hit-by-pitch themselves, but nothing else came from that. How's that related? Well, it's not really, but my answer would be boring otherwise. 3. Before this year the Rays had never won more than 70 games in a season. Now they are just four wins away from the World Series! Could you be content if Tampa Bay’s run ended here? RJ: Content? Yes, satisfied? No. This season has been incredible and nothing can derail it over the next few weeks. I'm not sure if I can handle an elimination game though. 4. Which aspect of Tampa Bay’s game (hitting, fielding, defense, base running) will we be talking about the most after this series, why? RJ: Defense. The Rays actual pitching is above average, but not upper tier. Their offense is about the same, but their defense is perhaps the best in the league. 5. You correctly picked the Rays to defeat the White Sox in the ALDS so what are you predicting for the ALCS? RJ: I predicted Rays in seven on DRB, but I could see it going to either team. 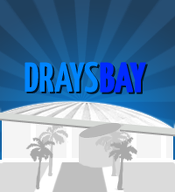 Follow the Tampa Bay Rays through the ALCS at DRays Bay!